The following chapter outlines the results of the GROMS project at its present stage. It is a cross-sectional database, based on species lists and fully referenced data from other databases or standard handbooks. The overall procedure for data entry and subsequent analysis is summarised in Figure 4.1. The first step was the identification of possible migratory species and higher taxa, according to the definitions of migration outlined in Table 2.1. Major information sources are summarised in Table 4.1. Species and population names were either entered manually (Non-Passerine birds: del Hoyo et al. 1992-2001), or transferred digitally from other databases (e.g. FishBase: Froese & Pauly 1999). Work flow diagram for the generation of GROMS data sets and subsequent analysis. For details, see text. Flußdiagramm zur Vorgehensweise bei der Erzeugung des GROMS Datenbestandes und anschließender Analysen. Einzelheiten im Text. In addition, all species listed by CMS were entered. Red List and CITES status was updated semi-automatically. If possible, a more detailed classification of migratory status was made (see Table 2.1). At present, the database contains 2852 vertebrate species. GIS maps on a global scale were generated for 544 species, and species lists for aggregation areas were entered by linking geographic sites with taxonomy files. The present geodata set allows first examples of GIS analysis, such as intersections with political boundaries (see section 4.4.1). The results form the basis for diversity calculations presented in Figures A2.86 and A2.87. In addition, the calculated species-by-territory tables (see chapter 3 and Figure 3.4) were imported into the GROMS database, allowing geographical queries, or listing of territories for each mapped species (note that a complete printout of these lists would require about 500 pages). 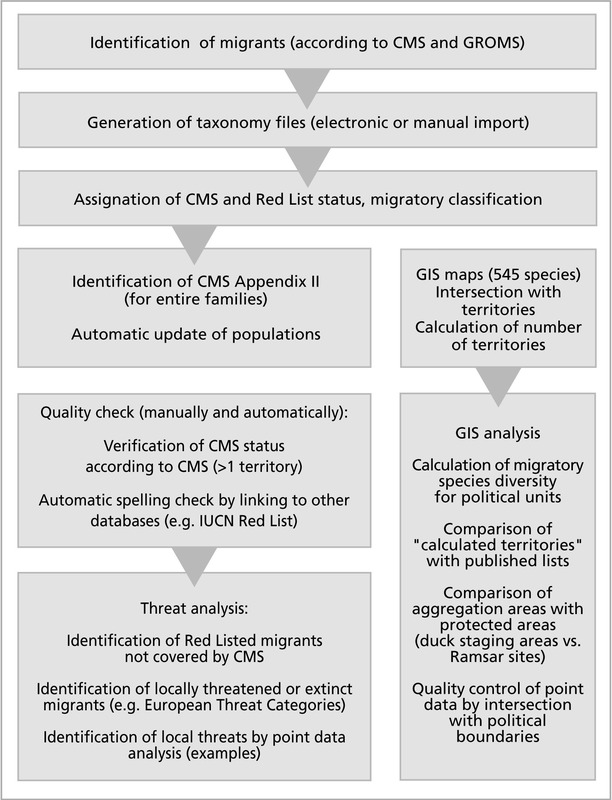 A subset of maps for most species listed in CMS Appendix I is included here, together with a short account on the species' migration behaviour and its present conservation status (see Annex II). Whole families such as flycatchers (Muscicapidae), sandpipers and snipes (Scolopacidae), plovers (Charadriidae) and dolphins (Delphinidae) are listed on CMS Appendix II (see chapter 2). After identification of migrants within these families, it was possible to update the Appendix II status of each species. However, migrants within one range state had to be removed, because the CMS definition of migration requires crossing of international boundaries. As a result, those CMS Appendix II species covered by inclusion of whole families are listed individually for the first time. The complete register of migrants is printed out in Annex III. The status of each species in CMS Appendices and their inclusion within CMS Agreements is given, together with their international Red List status and CITES listing. All maps, tables and species lists published in this report are extracted from the GROMS database. Note that lists in different formats can be generated easily by the database (see user guide, Annex I). Additional data mining is possible by searching the included literature database and a considerable number of full-text documents, including scientific studies, reports, and agreement texts, corresponding to about 5,000 pages of text. Quality checks were made manually and automatically, by comparisons with other available databases. GIS analysis was used for plausibility control of point data by comparison of country entries with the results of intersection with political boundaries. In a similar way, range state lists calculated by GIS intersections were compared with species-country lists from the IUCN Red List 2000 (Hilton-Taylor 2000). Finally, a first threat analysis was made by identification of threatened migrants, based on Red List data and a preliminary geographical identification of major threats. The outcome leads to suggestions for further listing of threatened migrants, which are presented within the respective special sections (sections 4.3ff).